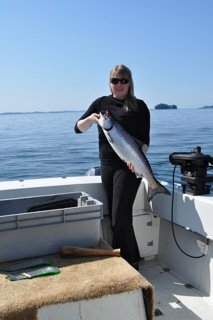 4th May, 2011: FISHING REPORT: Port Alberni Inlet, Barkley Sound, Ucluelet (West Coast), Somas-Stamp River System. The west coast of Vancouver Island is a wonderful area to visit and spend on vacation. Known for it unique settings and rugged coastlines Vancouver Islands west coast not only offers world class salmon fishing but also offers other adventures and unique cultural activities. Those visiting Vancouver Island during the late spring and summer months must take in not only a fishing adventure but also explore the great rainforests, beaches and lakes. When fishing out in scenic Barkley Sound or offshore one can view wildlife and also whale watch. When on land and visiting local communities visitors can seek out west coast culture, spa retreats, and of course take in some great west coast cuisine. Vancouver Islands West Coast has had superb salmon fishing in 2009 and 2010. The 2011 season is expected to be no different. The expectation of high numbers of migratory salmon headed to distant southern watersheds is already looking fantastic. 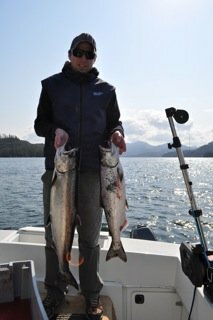 Salmon fishing around Ucluelet and the protected waters of scenic Barkley Sound has already been good with many clipped salmon in the high teens being landed by guides and their guests and also sport anglers fishing in their private boats. We are expecting the Port Alberni Inlet to have another remarkable Sockeye season with forecast return numbers at about 650,000. The Sockeye season usually begins in mid June and continues into the first week of August. Salmon fishing in Barkely Sound, along the surf line and also offshore waters will continue from now through mid September or longer. Look for another banner sport salmon fishing year on British Columbia’s west coast---Vancouver Island. The month of April and May is often quiet in the Alberni Inlet except for the many prawners who are out on the water daily. Prawn season opened on April 1st and was very good through the month with some great catches of prawns. This has also been very true in Barkley Sound. Guide boats in the early spring include in their salmon fishing trips, prawn fishing. Usually the prawn traps are dropped before fishing and then after fishing the traps are picked up to find the great prize coming up from the ocean floor. Barkley Sound fishing has dramatically picked up over the last couple of weeks. Swale Rock, Vernon Bay, and Alan Point have all been producing some nice salmon in the eleven to fifteen pound range. Many of the Chinook as of late have been clipped with thought that many of these Chinook are the early run of salmon migrating to rivers to the south. The salmon have been relatively deep from 85 to 125 feet. A variety of coyote spoons have been working. Green glow has been a favorite in the four inch size as has the green nickel and silver glow. Some guides and sport fishermen have been just using silver spoons while others are doing well using a variety of white hootchies. There have also been a few favorable reports in Samatao Bay, Pill Point and Diplock. One angler reported playing four nice salmon in Samatao in fifty feet of water. A green glow four inch coyote spoon was working well behind a green glow hotspot flasher. Fishermen trolling with anchovy have had their best success using a chartreuse or green Rhys Davis teaser head with a six foot tail. There have been some good sized bait balls in many of the areas. We are expecting the fishing to be very good through the summer months . The mid summer run of Chinook and Coho which begins in late June and run into early August is expected to be one of the largest run of salmon headed to the Columbia and Willamette systems to the south. Many of the salmon will be four and five year olds which often means some good sized Chinook over thirty pounds. The surf line areas of the Sound as well as areas such as Kirby Point, Gilbrlator, and Swale Rock should have some great fishing as the rich resources of bait fish come into those areas which bring in the big tyee. Ucluelet is one of those spots where it is possible to land a twenty pound salmon every month of the year. Of course weather plays an important role in terms of getting out onto the water. During the winter months it seems there are breaks in the weather patterns which makes it possible for keen anglers to get ot on the water. 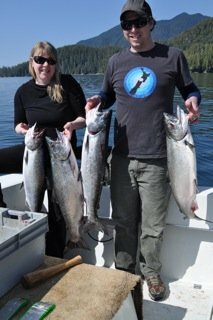 The full month of March right up to mid April the fishing close to the Ucluelet Harbor had been quite consistent. The Alley, Great Bear, Forbes, Sail Rock and Beg Island were all producing some nice feeder Chinook. With the weather changing the last few weeks guided trips and sports anglers have been able to get further offshore. The Inner South Bank has been good, especially over the past weekend. The guided trips have had some great fishing with limits on Chinook weighing up to seventeen and eighteen pounds. The Inner South Bank has been most favorable for those fishing close to the bottom at 135 feet. Some have had success using purple haze and army truck glow hootchies. The white Turd and the T-Rex hootchie have been very good for some guides and sport fishermen with both pieces of plastic producing the best catches for a couple of our Ucluelet guides. The past weekend also saw some of the first halibut of the season. The Halis have been migrating back to the deep and usually by the third week of May have migrated back to the shallows. The white Turd for one guide was good for two fifteen pound halibut fishing the Inner South. May and June should prove to be two very good good fishing months with some nice Coho coming into the mix in late June when the big migratory flow of the mid summer run begins. Look for some great fish in the high thirties and low forties this summer. The Ucluelet ladder derby began on May 1st and will continue until the Labor Day Weekend with the final derby the second weekend of September. The cost of the Ucluelet ladder derby is $50 for the year or for each trip out on a guided trip the cost is $10. There are great monthly prizes for the top fish. Last year there were some excellent money wins per month by a variety of very happy fishing individuals. The winter Steelhead season is all but over. Many of the spawned out fish are heading back down the river and out to the waters of the vast Pacific. 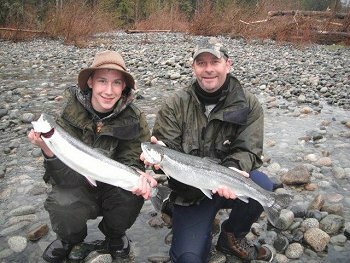 The Fall of 2011 is once expected to be very good with plenty of early chinook and coho and summer Steelhead in the mix. Those keen on fly fishing should look at booking trips from the 10th of October into the first ten days of November.